Gunturu Seshenrdra Sharma(20th October 1927-30th May 2007)better known as seshendra, poet/critic/scholar was born on 20th October 1927 in Andhra pradesh (India). -Graduated from the Andhra Christian college (guntur A.P), did Law from the Madras University, He worked as Deputy Municipal Commissioner in The government of Andhra Pradesh for 37 years. He knows Telugu, English, Hindi and Sanskrit proficiently. It was with a translation from Mathew Arnold"s"Shahnama" the Persian Epic that Seshendra first appeared in Print (1952) Inevitably a Poet is known mainly for the works that brought recognition to him. We shall think of seshendra primarily as the author of*my country my people* Modern epic, SESHA JYOTSNA, The burning Sun, poet’s notebook" Arc of blood (Rakta Rekha),"TURNED INTO WATER AND FLED AWAY, GORILLA, ME AND MY PEACOK OR THE PEACOCK AND MY ME. Epics like ADHUNIK MAHABHARATHAM, JANAVAMSAM Spiralled his emergence on the Indian literary scene establishing him as a major voice of the country. Added to this are his books of criticism "SHODASI"(A TANTRIC COMMENTARY OF VALMIKI’S RAMAYAN) SWARNA HAMSA (A TANTRIC COMMENTARY OF HARSHA Bhatta"s naishadhiya charitam) and KAVI SENA MANIFESTO (ADHINIK KAVYA SASTRA) besides short stories and plays. He is recipient of the central Sahitya academy Fellow ship, the highest honour in the literary world of India reserved forimmortals of literature. Yuva kalaa Vaahini, a popular cultural organisation felicitated him recently and honoured him with the title seshendra; visionary poet of the Millennium. His anthology of the Millennium poems’. FROM WORD TO CENTURY has been brought out by JYOTHSNA PUBLICATIONS in October 2000. Here are some poems from that anthology. It is impossible to read these poems without arriving at Seshendra’s prodigious talent. In his poetry there is enormous variety, a skill in condensing the most difficult dialectics of life into ordinary dialogue, highest concepts of mind emerge as a form of powerful and moving literature, giving to its readers fresh thinking and growth…… His poetry is an instrument against darkness and absolute inertia of this generation, a revolt against the present crisis, not of one country, but the crisis of the whole mankind, the crisis of the century. This is the age when human values which in the past were merely tenets of religious preaching are converted into demands of the people all over the world. They have become the flags and slogans of the 20th century. The total picture of this spirit of 20th century is poetry of Seshendra, a rationalized concept, extracted by mature comprehension of the trends of modern history. Seshendra’s mind is a laboratory where he distills experience and pictures poems where he experiments with evasive concepts and binds them as one would with twine symbols and words to graft a new poetic personality for this age. The poet wants a dynamic power to be infused into the spine of poetry which would rise to its full height and capture the imagination of the present generation. These poems are a peremptory need of today. and their emancipation from slavery and colonialism wresting equality from the hands of brute forces and forging links of brotherhood across mankind. perhaps for the first time saw the world stand on the brink of the dilemma of one world or destruction. It is a very inspiring century, its achievements are unique. A poet who is not conscious of this context fails in his existence as poet." HYDERABAD: An era of scholastic excellence and poetic grandeur has come to an end in the passing away of Gunturu Seshendra Sarma, one of the foremost poets and critics in Telugu literature. His mastery over western literature and Indian `Alankara Sastra' gave his works a stunning imagery, unparalleled in modern Indian works. One of the ironies in literature is that he came to be known more as a critic than a poet. The Central Sahitya Akademi award was conferred on him for his work `Kaala Rekhalu' and not for his poetic excellence. The genius in him made him explore `Kundalini Yoga' in his treatise on Ramayana in `Shodasi' convincingly. His intellectual quest further made him probe `Naishadha Kaavya' in the backdrop of `Lalita Sahasra Naamavali', `Soundarya Lahari' and `Kama Kala Vilasam' in `Swarna Hamsa', Dr. Suprasannacharya once recalled. Seshendra saw the entire universe as a storehouse of images and signs to which imagination was to make value-addition. Like Stephene Mallarme who was considered a prophet of symbolism in French literature, Seshendra Sarma too believed that art alone would survive in the universe along with poetry. He believed that the main vocation of human beings was to be artists and poets. His `Kavisena Manifesto' gave a new direction to modern criticism making it a landmark work in poetics. Telugus would rue the intellectual impoverishment they suffered in maintaining a `distance' from him. Seshendra could have given us more, but we did not deserve it! The denial of the Jnanpeeth Award to him proves it. 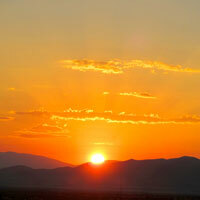 “life kindles the flame of poetry. 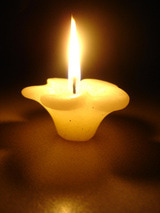 the poet being the wick that burns to shed warmth and light. the sun can show visible objects like building, trees, birds, hills, people and so on. poetry shows, on the other hand, life with its joys and sorrows, its secrets, problems and finally its solutions. wisdom is given in capsules of metaphors, the basic units of poems.” that was gunturu seshendra sharma, telugu poet, critic, and scholar, after winning the sahitya akademi’s award. no wonder seshendra’s genre of poetry, characterized by long poems, reflects human suffering, agony and deprivation of the poor if a poet is one who has intense emotional feeling, seshendra personifies them all. sitting cross-legged in a period settee, he brought forth al his emotions, during an interview. “ my personal experiences which moved me into intense emotional levels took shape as poems”. easily one of the best know telugu poets in the hindi belt of north india, his works translated into different languages have come in for liberal appreciation by litterateurs like ali sardar jafri, dr. viswambharnath upadhyay, veerendra kumar jain and prof. indranath chowdary he renders poetry and literary criticism with equal felicity. these features fetched him the sahitya akademi award both as a poet and a literary critic the award was for his work “kaala rekha”., a collection of essays on comparative literature, laced with poetic passages full of metaphors. “ symbols and metaphors visit only those who have prepared themselves as the medium to receive them. the difference between an ordinary soul and a poet is that the latter cultures himself by going near and getting involved in life and literature. by such a process of involvement one ceases to be the ordinary individual and becomes too sensitive and, therefore susceptible to the invasion life on him. he is like a fiddle with strings drawn to the final limit and even a whiff of wind can knock out a note of melody from the vibrant strings. at this point the individual is called poet”. he says. seshendra has authored over 40 books mostly of poetry, a play, a short story, and many essays and shot into fame with the modern epic ‘naa desham-naa prajalu’ (my country-my people-modern indian epic) published in 1975, widely hailed as ‘turning point’ for its significant contribution not just to telugu literature but to indian literature as a whole. it was soon rendered in english, hindi, and urdu, the last by akhatar hassan with a foreword by the urdu poet, ali sardar jafri. the greek translation had a foreword by nikhiphorus vrittakos. widely traveled, his depth in understanding of telugu, sanskrit, hindi, english french and german literatures appears to be rarely matched. along with “ naa desham-naa prajalu”.”munday suryudu”(the burning sun) ,his second long poem and “gorilla’, ‘gave for the first time a genuine poetic expression to the revolutionary content, introduced into telugu poetry by sri sri, four decades ago, as the telugu university acknowledged in the ecitation presented to him while conferring on him the d.litt degree in 1994. “ this is a historic event in the annals of telugu poetry. from then the non-metaphorical writing that was prevailing for over years in the name of poetry, before seshendra, came to a halt; and metaphorical writing became the order of the day. the same new poetic idiom created by seshendra is even now in vogue having been adopted by all. for this reason, seshendra has a unique place in telugu literature, as a trendsetter and architect of a new era. 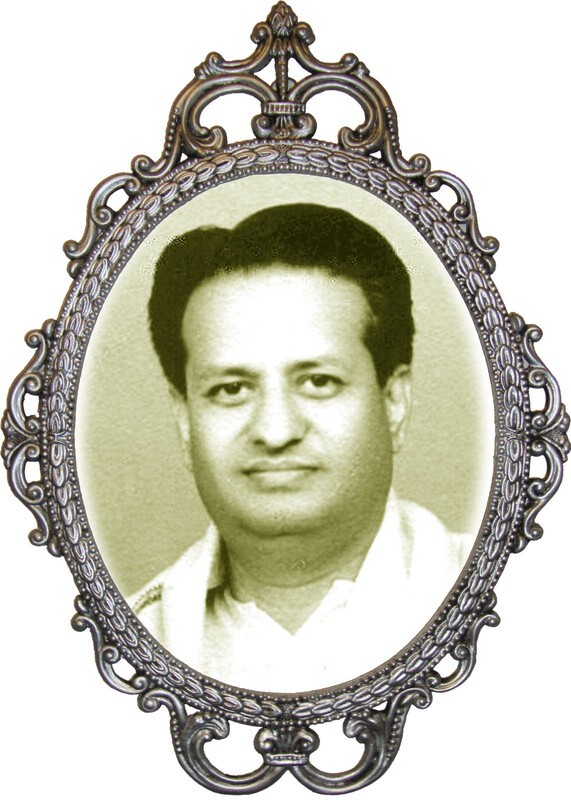 the emergence of mahakavi seshendra sharma in telugu literature ushered in a dazzling new era. whenever his poetic vision touches the destiny of mankind, it had unfolded in a lofty and stentorian voice.. adds the telugu university citation, describing seshendra’s works and the poet in him with near perfection. his other works include “ rithu ghosha” written when he a was a municipal commissioner of bobbili, ‘shodasi’ his original tantric commentary on sundarakanda of valmiki ramayana, ‘swarna hamsa’, another tantric commentary on naishadhiya charitam of harsha bhatta and sesha jyotsna. having got the copyright, his second son, saatyaki, now started publishing his works through jyotsna publications. one such publication ‘sahitya darshini’ sparked a debate in the telugu literary world last year, as it contains scathing comment on the poet’s contemporaries. born on october 20, 1927 in nellore, seshendra’s first encounter with poetry was early in his childhood, the scholarly background of his family influencing him. his published work dating back to 1946 as a student and contemporary of former chief minister, n.t. rama rao, in a.c. college, was nothing short of being revolutionary and outrageous, though it was for the college magazine. he wrote ‘chandalopi mama guruhu’, depicting sankaracharya’s encounter with a dalit on the banks of the ganga. at eh age of 24, he rendered ‘sohrab and rustom’ from persian epic shahnaama. awards came to him, especially in his home state of andhra pradesh rather belatedly; an aspect which continues to hurt him. “ though i have been in poetry and literature for so many decades now, i got the first award in 1993, that too not in the state but from the rashriya hindi academy in calcutta”. the next was again from the akhil bharatiya rajbhasha sammelan in 1994. there was no stopping and he invited to attend the world hindi conference at nagpur in 1975, and the last one at trinidad in 1996. Book release of "From word to century" collection of Millennium poems and presentation of the title "Visionary poet of the millennium"
In the photo Mr. B.N. 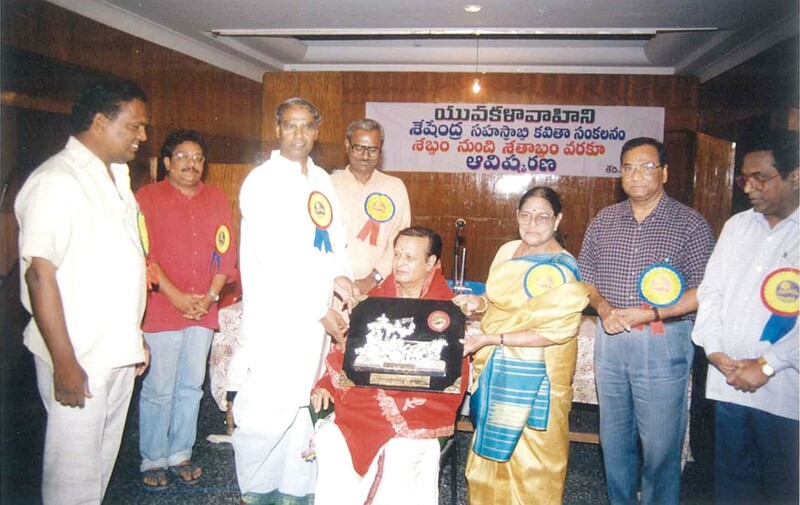 Reddy, Prof. Kasireddy venkat reddy, J. Bapu reddy, I. Srikanth sharma, Y.K Nageshwara rao and Others.